The Police Service of Northern Ireland (PSNI; Irish: Seirbhís Póilíneachta Thuaisceart Éireann); is the police force that serves Northern Ireland. It is the successor to the Royal Ulster Constabulary after it was reformed and renamed in 2001 on the recommendation of the Patten Report. In comparison with the other 44 territorial police forces of the United Kingdom, the PSNI is the third largest in terms of officer numbers (after the Metropolitan Police Service and Police Scotland) and the second largest in terms of geographic area of responsibility, after Police Scotland. The PSNI is about half the size of Ireland's Garda Síochána in terms of officer numbers. ^ "Freedom of Information Request : Police Dogs Owned and/or Used by PSNI" (PDF). Psni.police.uk. Retrieved 2015-08-01. ^ "A New Beginning : Policing in Northern Ireland" (PDF). Cain.ulst.ac.uk. Retrieved 2015-08-01. ^ a b "Police (Northern Ireland) Act 2000". Statutelaw.gov.uk. Retrieved 2015-08-01. ^ "Police Pay Review". Police-information.co.uk. Retrieved 2015-08-01. ^ "Freedom of Information Request : Human Resources" (PDF). Psni.police.uk. Archived from the original (PDF) on 2 April 2014. Retrieved 2015-08-01. 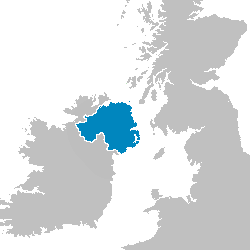 ^ "Workforce Composition Figures | Police Service of Northern Ireland". Psni.police.uk. 2008-10-01. Retrieved 2015-08-01. ^ "CAIN: The Patten Report on Policing: Summary of Recommendations, 9 September 1999". Cain.ulst.ac.uk. 1999-09-09. Archived from the original on 13 May 2008. Retrieved 2017-05-27. ^ "Police Emblems and Flags Regulations (Northern Ireland) 2002". Opsi.gov.uk. 2011-07-05. Retrieved 2015-08-01. ^ "OVIK: CROSSWAY Armoured and Special Role Vehicles and Chassis". Oviks.com. Retrieved 2015-08-01. ^ "Penman" (PDF). Penman.co.uk. Retrieved 2015-08-01. ^ "Freedom of Information Request : Use of Bicycles by PSNI" (PDF). Psni.police.uk. Archived from the original (PDF) on 3 April 2014. Retrieved 2015-08-01. ^ "Northern Ireland police service orders EC145 helicopter - CJI Main Site". Corporatejetinvestor.com. 2013-03-14. Retrieved 2015-08-01. ^ "Civil Aviation authority : Mark G-PSNR" (PDF). Caa.co.uk. Retrieved 2015-08-01. ^ "Civil Aviation authority : Mark G-BSWR" (webpage). Caa.co.uk. Retrieved 2015-08-05. ^ "Civil Aviation authority : Mark G-CGTC" (webpage). Caa.co.uk. Retrieved 2015-08-05. ^ "Freedom of Information Request : Blackberry Mobile Phones=Psni.police.uk" (PDF). Archived from the original (PDF) on 2 April 2014. Retrieved 2015-08-01.